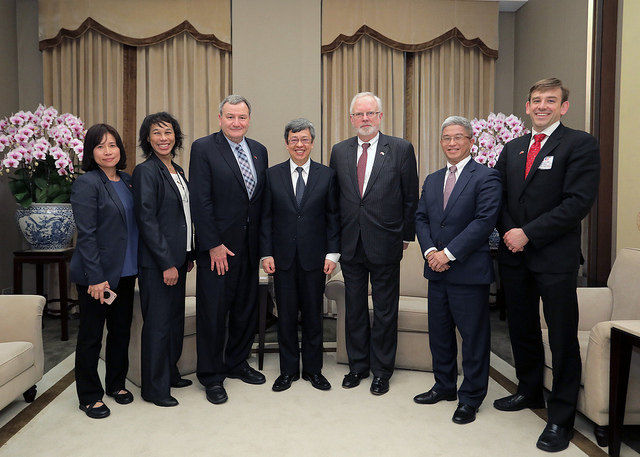 A delegation of academics from Stanford University on a six-day political and security fact-finding visit to Taiwan was received by Vice President Chen Chien-jen at the Presidential Office March 18 in Taipei City. Taiwan and the U.S. are important strategic and economic partners, Chen said. Relations continue to go from strength to strength and reflect the shared values of freedom, democracy and a deep-seated respect for human rights cherished by the two sides, he added. As Taiwan and the U.S. celebrate the 40th anniversary of the Taiwan Relations Act, Chen said, the government and the people sincerely appreciate the efforts of Washington to provide defensive weaponry and engage in constructive dialogue with China to advance the positive development of cross-strait relations. Led by Karl Eikenberry, a faculty member of the Shorenstein Asia-Pacific Research Center and former U.S. ambassador to Afghanistan, the delegation also includes former U.S. Ambassador to Vietnam David B. Shear. Other members are Kharis Templeman, manager of the Taiwan Democracy and Security Project, U.S.-Asia Security Initiative; and USASI Associate Director Belinda A. Yeomans. According to Chen, the government is delivering on its promise to upgrade Taiwan’s indigenous defense preparedness, citing a year-on-year increase of 5.6 percent in related expenditure to US$11 billion for 2019. Taiwan’s national security is a major factor in maintaining regional peace and stability, Chen said. At a time when China is increasing military activity near the country, the government will not falter in its commitment to working with like-minded partners in promoting peace, stability and prosperity throughout the Asia-Pacific, he added. Chen also took the opportunity to thank Eikenberry for leading the USASI, a platform launched in July 2015 to facilitate interdisciplinary, policy-relevant research on security issues and promote cooperation in the region.